Knopf Books for Young Readers, 9780375867002, 464pp. R. A. Nelson takes us on a supernatural thrill ride, a modern-day vampire story set on a NASA base and filled with space-and-science intrigue. Seventeen-year-old Emma feels cursed by her epilepsy—until the lost night. She's shocked to wake up in the hospital one morning, weak from blood loss. When her memories begin to return, she pieces together that it was a man—a monster—who attacked her: a vampire named Wirtz. And it was her very condition that saved her: a grand mal seizure interrupted Wirtz and left Emma with all the amazing powers of a vampire—heightened senses, rapid speed—but no need to drink blood. Is Emma now a half-vampire girl? One thing soon becomes clear: the vampire Wirtz is fierce and merciless, feared even by his own kind, and won't leave a job undone. R. A. NELSON is the author of "Teach Me," a Book Sense Kid Pick, "Breathe My Name" ("Incandescent"--"Kirkus Reviews"), and "Days of Little Texas." He lives in north Alabama with his wife and four sons and works at NASA's Marshall Space Flight Center. Visit him on the Web at RANelsonBooks.com. "Nelson offers...variation to the vampire YA heap with his pseudo-transformation epileptic chick, but even more interesting and memorable is the thoughtful exploration of the way logic and faith (in varying forms) can sometimes yield much more remarkable results than either alone." "Nelson (Days of Little Texas) proves that the vampire genre is not entirely sucked dry with this fast-paced adventure featuring an enjoyably flawed heroine...With a pseudoscientific take on vampires, a smattering of Germanic lore, and a strikingly unconventional showdown, this is a robust alternative to the forbidden love tropes of wispier vampire novels." "This is not your regular vamp fare, guys and gals. From the romance that is anything but trite, to the amazing science fiction aspects, you will find yourself FINALLY happy that a good writer wrote a very good vampire book. Enjoy!" 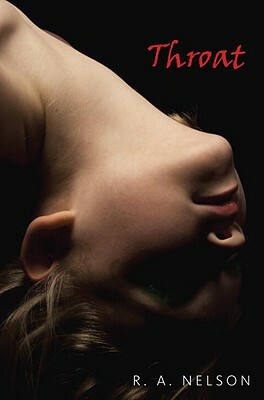 "I picked up a bit of German vocabulary as Emma's grandfather, Papi, and all the vampires speak the language; I was given an insider's view of what it's like to live with epilepsy; and I learned some things about vampires that I never knew before...THROAT is quite well-written, and I very much enjoyed reading it. I think you will, too." "This unusual supernatural thriller shines a different light on vampires."